I LOVE my mom's Lemon Meringue Pie!!! It is simply the BEST!! I've made it every Mother's Day for years now. We always look forward to it. Beat eggs yolk; stir in sweetened condensed milk and lemon juice. Pour into pie shell. Beat egg whites with cream of tartar until soft peaks form; gradually add sugar- beat until stuff but not dry. Spread on top of pie, sealing CAREFULLY to edge of shell. Bake 12- 15 minutes at 350 degrees or until meringue is golden brown. I surely wish I could share a slice with you!!! Oh, it looks yummy! I wish you could share a slice with me, too! PS: I didn't know you had that tradition, how neat! That looks absolutely perfect! I've never had a lemon mer. pie with a graham cracker crust! That sounds heavenly! What a beautiful slice of pie!! That looks FABULOUS and surprisingly simple! Thank you for sharing it--I will make it very soon! 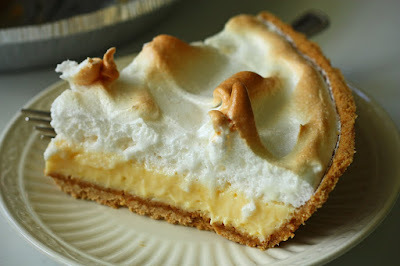 Oh I love lemon meringue pie, it looks just delicious. Your meringue looks perfect! How did you do that? You continually impress me with your way around the kitchen! I tried to make meringue recently and ended up using Reddi Whip - oh well! Can you mail me a piece - please!!!???? scrumptious!!! 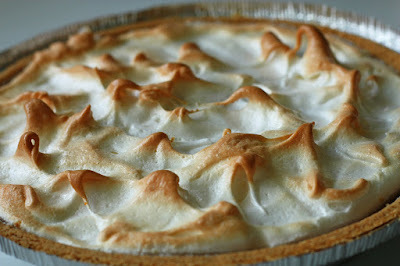 I have been looking for a good Lemon Meringue Pie recipe.... thank you soooooo much for sharing! Oh that looks soooo good. I bet its not fat free though huh.